This article was published in our regular travel column in the January 2001 issue of Ottawa Life magazine. 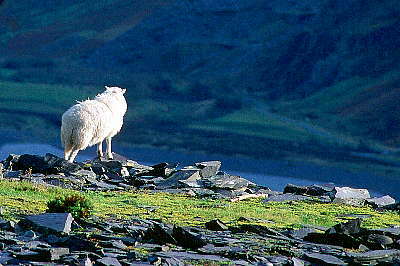 We enjoyed 10 days of exploring Wales in November of 2000. Croeso y Cymru! Welcome to Wales! The hearty greeting met us throughout Wales, a land of enchantment where pastoral scenes abound. Whether it’s fluffy white sheep dotting a pasture or a 12th Century castle rising dramatically from a windswept coastline, Wales is elegantly picturesque. 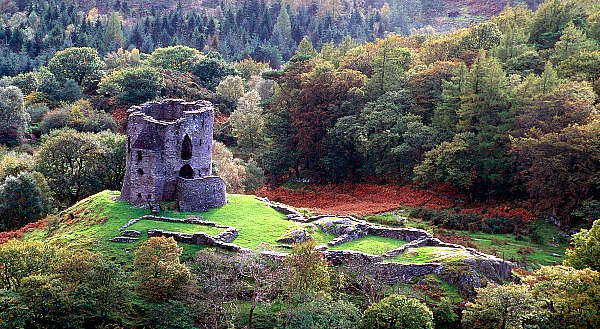 Indeed, castle enthusiasts will enjoy Wales, which boasts more castles per square mile than anywhere else in Europe. Reminders of our nation’s connections to Wales are everywhere, with place names such as Bala and Pembroke, and surnames like Jones. The oldest living language in Europe, Welsh blends Latin, Anglo-Saxon English and Norman French into an appealing, if not slightly guttural-sounding rhythm. Today Welsh is enjoying a revival thanks to its re-introduction to schools. There’s also a Welsh language television station (S4C), and a multitude of bilingual (English and Welsh) signs, brochures and books. In fact, language and culture is perhaps the first of our reasons to visit Wales. And, where better to start to explore the culture of the country than in its capital, Cardiff? Evidently the Romans pined for their home country’s sunny warmth, for by the 5th Century they had left… but not before erecting a fort. Other invaders came and left their mark: Saxons, Normans and English. Cardiff Castle, whose walls rise from the city centre, remains as an architectural blend representative of each conquering people. Inside Cardiff Castle the Welsh flag — a scarlet dragon against a white and green backdrop — snaps in the breeze atop a Norman keep. But the castle is also Victorian because, in the late 1800s, the Third Marquis of Bute decided he wanted to live here. Purported at the time to be the richest man in the world, this coal magnate spared no expense and the result is a fabulous Victorian whimsy of marquetry and magic, including a rooftop watergarden. However, Cardiff is more than the castle. Everyone who explores Britain wants to try out a pub and here in the Welsh capital, narrow streets and quaint watering holes abound. Just outside the castle gates is The Goat Major, where we sampled fare from Cardiff’s Brain Brewery. Inexpensive at £1.86 for a pint we tried both the bitter and lager. Along with a pub lunch of plaice and chips (don’t forget the malt vinegar), the result proved delicious and the ambiance satisfyingly local and surprisingly non-touristy. Culture-vultures will enjoy the National Museum of Wales which houses a little bit of everything, from botany and geology to exhibits of Welsh paintings. Particularly striking was “The Bard” painted in 1774 by Thomas Jones. Based upon Thomas Gray’s poem of 1775, this dramatic piece depicts King Edward I’s massacre of the Welsh poet-singers in the 12th Century. Such pictorial clues bear witness to Wales’ troubled past and struggle for cultural — if not national — recognition that continues today. We lingered in Cardiff, using it as a centre from which to enjoy varied day-trips. Using our BritRail pass, we ventured to Tenby, a mediaeval town that became a Victorian seaside resort on Wales’ southwest coast. No wonder the Victorians popularized it, for Tenby is unabashedly picturesque. The 400-year-old ruins of St David’s church are built on a still-older monastery, both perched on a craggy outcrop of rock jutting into the sea. The village’s crescent-shaped harbour is sheltered by a stone pier originally built between 1327-77. Gaily coloured fishing boats dotted “The Sluice’s” beach, all cast adrift on the sand at low tide, while owners mended nets and stacked traps on the pier. Two curvaceous blonde beaches provide visitors and locals alike a splendid forum for jogging, exercising dogs and generally taking the air which was all-too briskly blowing the day we visited. At 70 mph it constituted a gale… but no matter, being “blown away” in Tenby was exhilarating. Next on our agenda was to “go wild in Wales” with horseback riding (called pony-trekking) and hiking. Leaving Cardiff, we drove north into the heart of Brecon Beacons National Park to the eight-hundred year-old ruins of Llanthony Abbey, where Augustinian monks once sang their vespers. Here the rolling countryside resembles a patchwork quilt of green pastures defined by stone walls or hedgerows. Fluffy sheep, woolly-looking horses and shaggy cattle grazed amid this natural beauty. Once astride our Welsh Cob horses, our pace slowed to a leisurely walk that allowed us to grab a handful of blackberries as we passed alongside the hedgerows. These living fences are made of carefully pruned hawthorn, holly and other bushes, along with twining ivy, wild rose and other plants such as wild clematis. Peering inside their green walls, we glimpsed the “animal highway” left by tracks of various creatures, and sometimes spied last summer’s bird’s nests. After riding, we made our way to Presteigne to stay at a 16th century inn, the Radnorshire Arms, built by one of Elizabeth I’s courtiers. The Jacobean interior was resplendent with antique furniture, gleaming horse-brass, and plush bedrooms (ours boasted a four-poster bed). Although new rooms have been added, the pub, small dining room and some bedrooms are original construction, including a “secret cupboard” built into the oak paneling beside the dining room fireplace. We discovered that Welsh dining encourages one to seek exercise. Everything we sampled was the freshest of fare, from crisp salads to tender lamb, through to the superb collection of Welsh cheeses. Don’t even think of saying no to that most-British of customs, finishing off a meal with a cheese plate. Try Welsh cheeses like Caerphilly (made in the village of the same name which, of course, also boasts a splendid castle), Cenarth (a smoked cheese), or Yfeni (made with mustard and ale). Walking is particularly appealing after such meals, and it’s easy to go wild over the Welsh walks. Our sampling included an attempt at climbing Wales’ highest peak, Snowdon but blowing rain and swirling mist beat us back. Undaunted by mere rain, however, we donned our wet gear and hiked Lake Vyrnwy’s pretty trails alongside stone walls to a waterfall. This lake and it’s astonishing dam were created in the 1880s to supply water to Liverpool — some 70 kilometres away by mostly underground tunnels. We ran out of time, but we’d like to hike along Offa’s Dyke, a sinuous earthen bank up to 8 metres high constructed as a defense against the Welsh by Offa, King of Mercia (the English Midlands). It meanders 128 km through spectacular countryside and crosses the border between England and Wales ten times. But this is only one of the many “must-see, must-do” activities that make us long to return to Wales. Whether it’s castles, walking, riding, culture — or dining on fine fare, Wales is well worth a visit. We flew on a Virgin Atlantic flight to London. Anticipating delays at Heathrow Airport, we were pleasantly surprised to find convenient trains leaving every few minutes to connect to high speed trains. We were in Cardiff within 3 hours of landing. Cardiff has an excellent selection of accommodation, from the stunning new 5-star St David’s Hotel (with pool and spa) on Cardiff Bay to smaller B&Bs such as the Lincoln House Hotel on Cathedral Road. Note that throughout Wales, quoted prices for B&Bs are per person, so that £20 means £40 for a couple (including what is usually a simply stupendous “full cooked breakfast” of any/all of kippers, sausages, eggs, bacon, toast, jams, baked beans…). Once out of the capital, there are a host of farm stays such as Gogarth Hall Farm in Machyllneth (e-mail brees2000@aol.com) which offers outstanding self-catering facilities in a recently refurbished, 300-year old stable. Although the Wales Tourism Board website (www.visitwales.com) recommends booking ahead, we were there in off-peak season (October) and almost immediately found a comfortable family-run hotel across the river from Cardiff Castle. Ask them for details about any of the places we’ve mentioned: we found them extremely helpful. At 225 kms from north to south, Wales is not a big country. However, the curvy and sometimes alarmingly narrow roads make it seem a lot bigger. You can rent cars in major centres but remember that you’ll be driving on the left so take an extra moment at intersections to look both ways. And be prepared for “sticker shock” at the pumps: gas was almost C$2 per litre in October 2000. For more relaxed travel, consider the trains or bus.